The NPMap Symbol Library is the National Park Service’s web map icon set. We integrate these icons into our other mapping tools, including Park Tiles, Places, and NPMap.js/NPMap Builder. The latest version is 2.5.0. It was released on April 26, 2018. Web map symbols need a slim profile to reduce bulk at multiple zoom levels, render well within placemarkers, and not interfere with other classes of information. As a result, we've eliminated the bounding box for our symbols. Supporting black and white versions of each assures we can render them clearly on top of a wide range of base maps and placemarkers. Three sizes have been designed for each symbol for greater cartographic flexibility: 14, 22, and 30px. A subset of the symbols have been adapted to 12, 18, and 24px sizes for use in NPMap Builder placemarkers. We use an older version of the Maki toolset built by Mapbox to adapt our symbols for use in NPMap Builder as placemarkers. We will be replacing this system in 2018. When optimizing artwork that varies in size from 30px square for our largest stand-alone symbol size to as small as 9px square for 12px placemarkers, every pixel counts. We create our artwork to be as "pixel-perfect" as possible. In other words, we respect the pixel grid to make sure our symbols do not appear "fuzzy" on standard-resolution displays. 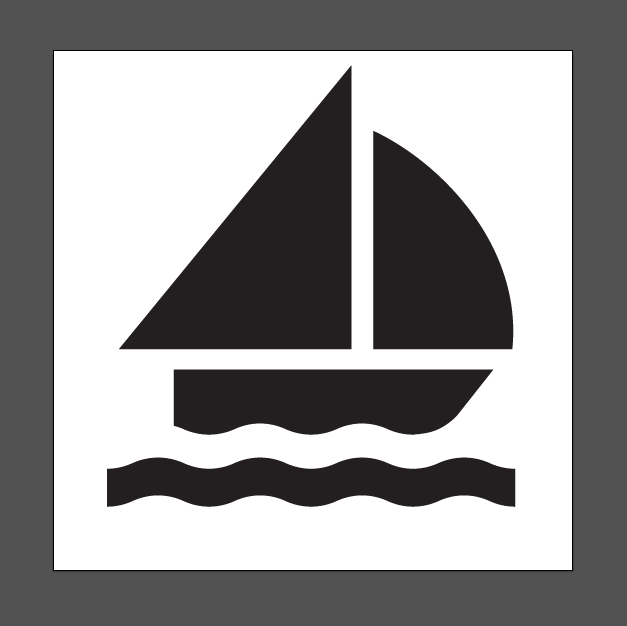 Our modified sailing symbol provides an example of artwork that remains legible at the scale of pixels. Our commitment to developing quality map symbols is driven by our larger pursuit to set the standard in web cartography. All of our maps are built with carefully considered symbolization that represents our parks in a way other web maps simply do not or cannot. That said, like most of our other tools, Symbol Library is available under a liberal open source license so others can build on top of and learn from our work.